Naturally curly and wavy gals (and guys) may be more affected by winter weather, especially when considering curl patterns. Protect your curls by practicing some winter-proofing tips and avoid some easy mistakes. For centuries, humankind has been transforming the ritual of bathing into a meaningful practice. Ancient Greek and Roman bathhouses combined healing rituals with entertainment, Japan believed the ritual of bathing was a spiritual pursuit of purity. Today, we use water as a healing element synonymous with relaxation; jacuzzis, birthing pools, hot springs baths, and mineral baths are socialized bathing rituals of the 21st century. Taking steps to protect your skin in the summer months is a no-brainer. But what your hair? Prolonged sun exposure can cause UV damage to hair cuticles. The good news is that there are precautions you can take to protect your hair from the summer sun. TO112's Console Hair Cream ﻿is the crème de la crème of summer sun hair protection. Dreaming of that long, beachy hair this summer? We sat down with Medulla & Co hair professionals to give you 6 tips if you’re looking to grow long, luscious hair and fast! How many opportunities did you let slip through your fingers in the past year because you were afraid of making a mistake? Did you learn a new skill, go for that big promotion, or book that plane ticket? This irrational fear of making mistakes could be holding you back from more than you realize. You’ve got 365 glorious days to take new risks, make new mistakes, and teach yourself something new in the process. TO112 is proudly cruelty free and often promotes being Leaping Bunny certified - but what exactly does that mean? In short, the Leaping Bunny Program is a certification program that expects companies to prove that they and their suppliers do not conduct animal testing. How to live a happy life? Yoga, meditation, crystal ceremonies, music ... the answers are endless. Who has the secret? If you were told to go barefoot for at least a few minutes daily, how would you respond? 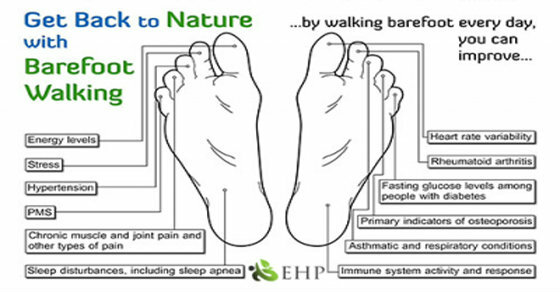 The astonishing fact is that there are many health benefits for Earthing/Grounding (the practise of coupling your body to the Earth’s surface energy by walking in direct contact with the Earth - ie, barefoot). Why? It all comes down to energy. renewed supply of free or mobile electrons. body rhythms, such as cortisol secretion." The Earth has a negative charge on its surface, and when you walk barefoot, you become a conduit as negative ions flood your body through the soles of the feet. These free electrons are powerful antioxidants that neutralize free radicals. Why are we in such need of the negative ions? Well, we live a lifestyle abundant with electronics (cell phones, tvs, laptops, microwaves, cell phone towers) that all emit signals, wifi and bluetooth which in-turn emit powerful positive ions. We are surrounded by these positive ions, and over-exposure cause irritability, tension, migraines, sleeplessness etc. *Lowering stress and promoting calmness by reducing stress hormones. There is nothing to lose by trying earthing, and the book Earthing: The Most Important Health Discovery Ever is filled with first hand stories of those who have benefited, as well as research and information from doctors, a cardiologist and an electrical engineer. Who's ready to take a walk au naturel? Celeb turned lifestyle guru Gwyneth Paltrow, aka Goop, made waves recently when she unveiled her newest thing: clean sleeping. Goop's branded lifestyle at times can be questionable (yoni stone, anyone? Oh, and here is the response to that one.) But Clean Sleep is one we can get behind. It may not be a new concept, but does anything really matter until it's uttered from Goop's perfectly glossed lips? Slated as thee 2017 trend, Clean Sleeping is something we can all benefit from and *should*. It sounds pretty obvious, right? Regularly clean sheets and sleeping attire, wash your face and hands and keep your bedroom relatively zen. Clean Sleeping (as a movement) goes beyond that. In basic terms, sleeping clean means sleeping the ideal 8 hours uninterrupted (the body/brain cleans itself during sleep) and Goop helps out by recommending items to aid in the endeavour (heated socks, copper laced pillowcases etc). In fact, she encourages you to strive for 10 hours of sleep. Sleeping the correct 8 hours is also important. It is recommended to get to bed for 10pm - sleeping 10pm to 6am allows us to follow our body's natural circadian rhythm. During these times, human body is designed to be at a state of rest, repair, detoxification and rejuvenation. The TO112 Restore (silk) Pillowcase is not only absolutely luxurious, but is beneficial to hair and skin. The silk won't draw moisture out from your hair/skin, and won't cause skin creases. Silk contains proteins that hair needs, which means that while you sleep, your hair is being nourished and will be softer in the morning (so, say goodbye to bedhead!). Inside the pillowcase is a satchel of lavender. When inhaled, Lavender is used to aid in sleep, decrease agitation and stress. The TO112 Restore Pillowcase will you give you a better beautiful clean sleep!